« Olympic athletes tap the inner fire — how about you? During my childhood years in Oklahoma, where I lived deep in the heart of Tornado Alley, I grew up with tornadoes more common that rainbows. I spent hours with my family in basements, underground shelters, or in the man-made cave on my grandparent’s farm waiting for the danger to pass. I’ve seen three funnels dancing up and down in the air a mile away and, at another time, a single funnel that seemed to my childhood eyes to be half a mile across, but none of those ever touched down near me. I even caught a tornado with my camera (making the cover of my local newspaper) in a part of Colorado where we don’t usually get tornadoes. 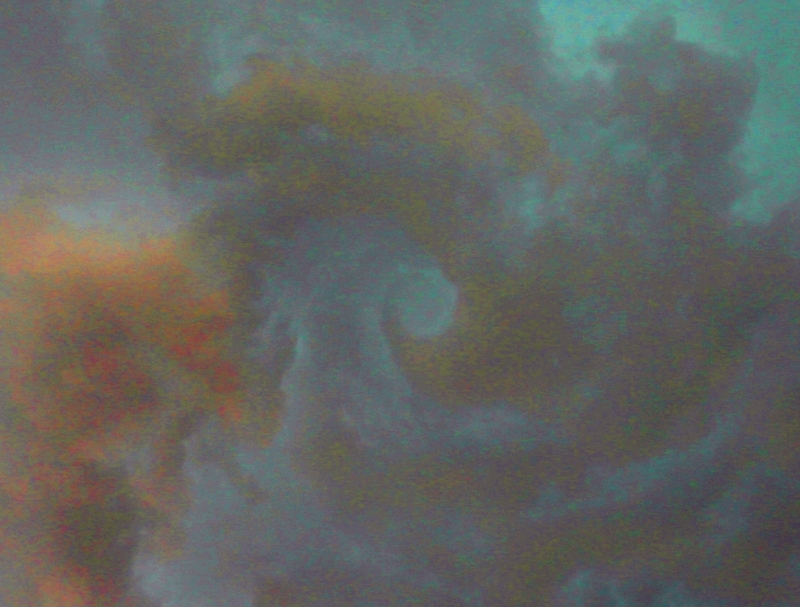 But a few weeks ago, I completely missed what looks like a funnel right above me as photographed some interesting clouds. 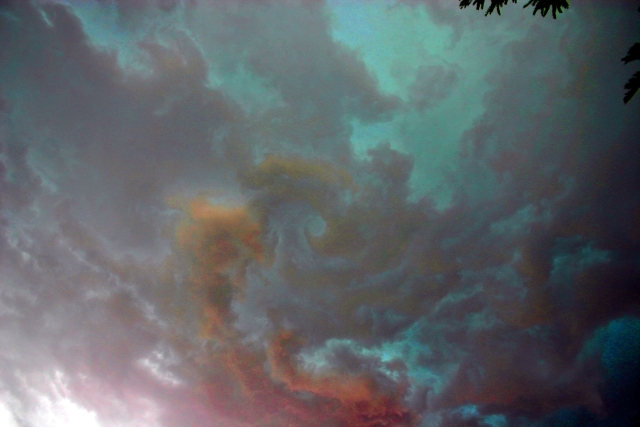 I just downloaded them onto my computer and realized “that cool looking swirl” was more than wind. This cloud swirling was over in a flash, and the storm brought a lot of wind and hail, but nothing more. I wonder: If what looks to be a funnel had become stable and big enough for me to really notice at the time, how long I would have stayed out there taking photos of such an amazing event — a tornado recorded from below as it happened? Now a question for you, dear readers, what makes you want to push the envelope and do something crazy? Wow! Cool pic. It’s fun to examine my pics after and discover things I never saw while I was shooting. My favourites are close ups of flowers, and then discovering after the fact beautiful little bugs amongst the petals. Okay to answer your question: when I have finally made the decision that I have nothing to lose and potentially everything to gain. TornadoPhotoWacko — Ha ha! I’ve seen the movie Twister about a dozen times. Fascintated with tornadoes… never experienced one though. I can’t remember anything crazy that I’ve ever done. I’ve taken risks but never thought of them as crazy. I took those risks because I knew I just had to do it. Like Davina, I don’t think I’ve done anything really crazy in my life. Would trapeze (once time only, basic swing & dismount move) count? Or once while hiking in Yosemite, my husband and I suddenly noticed a big bear and a cub to the side of our well-traveled trail. I just stopped and watched, and watched and watched — they looked so peaceful and seemed to be watching me back. Jeff made me move along b/c it wasn’t really safe to be that close to a bear and its cub. (sigh) I didn’t feel like I was doing something crazy but looking back now, maybe I was! Being at “nothing to lose” stages can be quite interesting, yes? Time to get a little crazy then! I liked that movie, too. The cow flying by was silly, but fun. LOL! Bears look peaceful because they are used to being at the top of the food chain. Trapeze? That’s just sounds scary to me. I held my breath too much as a kid watching them. I don’t know, I think it would be pretty compelling and hypnotic, no matter what your risk aversion!